New York Fashion Week has ended and now the editors are on their way to London if they are not there already. After that, they will cover fashion week in Milan and finally Paris. 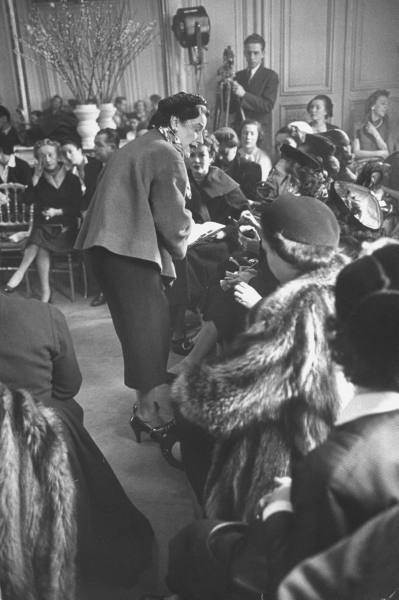 In March 1951, Life magazine featured an article about Vogue fashion editor Bettina Ballard entitled Bettina's Busy Day that followed the editor around Paris during fashion week in February 1951. What amazed me is that except for a few details and midnight photo sessions, the life of an editor hasn't changed much in 60 years. In the above photo, Bettina Ballard arrived at Balenciaga at 9:15am to select clothes while wearing a Balenciaga suit. 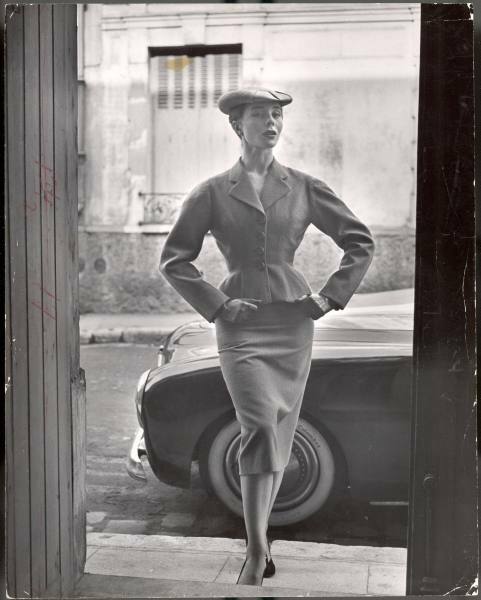 In the car are the coats and hats of the other fashion houses she will visit that day. At 10:15am, she arrived for the Schiaparelli opening and wore a Schiaparelli coat over her Balenciaga suit. She also greeted Bergdorf Goodman buyer Jessica Daube before finding her seat. 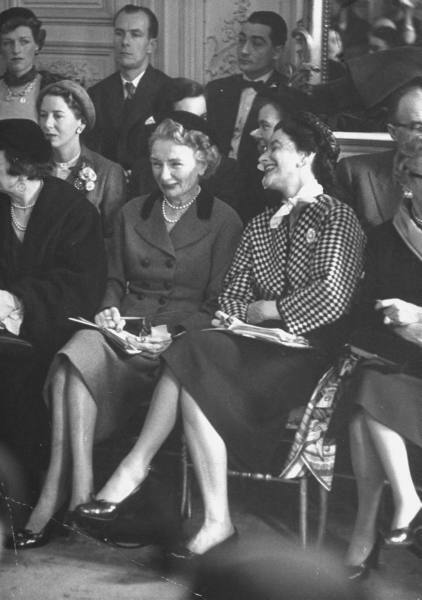 At Schiaparelli, Vogue editor Bettina Ballard sat next to Carmel Snow, the editor in chief of rival magazine Harper's Bazaar. That definitely doesn't happen today! After another change of clothes, she attended the Dior show wearing a black Dior suit. 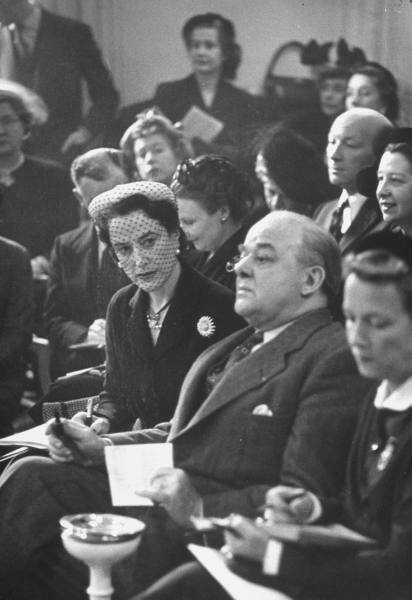 She sat next to Michel de Brunhoff the editor of French Vogue. There is also an ashtry next to the runway since everyone in those days smoked especially in Paris. 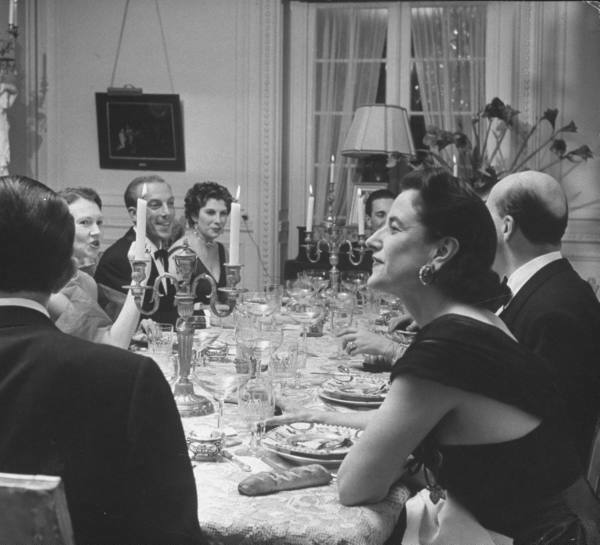 Bettina Ballard dined at the home of designer Jacques Fath with among others that included Duchesse de Brissac and Countess de Rosenberg. 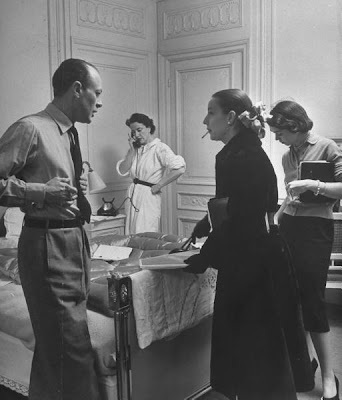 Bettina in a belted hotel robe holds a morning conference in her room at 8:00am with photographer John Rawlings and Vogue assistants Babs Simpson and Mary Haas. 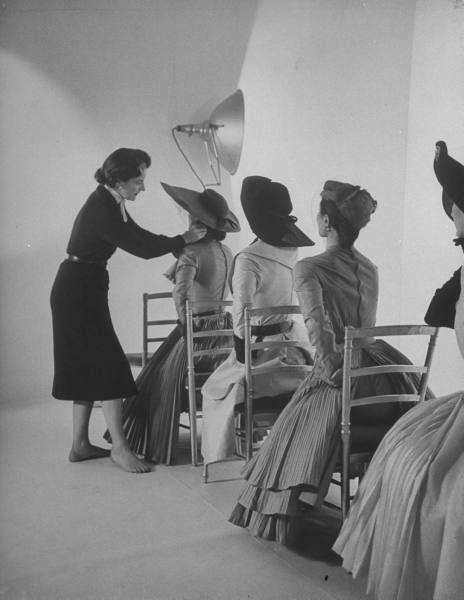 Designer clothing can be borrowed and sent around the world for photo shoots today but in 1951, night studio sessions were the only way clothes could be obtained from the fashion houses who also needed them to show buyers. 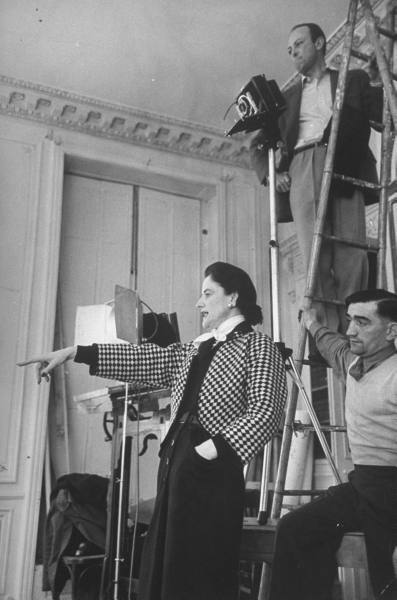 At midnight, Bettina and photographer John Rawlings direct models at a shoot. A photo taken in Paris. In the studio at night, Bettina poses models in pale pleated shantung Fath dresses. The photo was rushed into the March 1 issue of Vogue. At 2:00am while most of today's editors might be at a party, Bettina checks photos taken during the day and eats a late dinner. 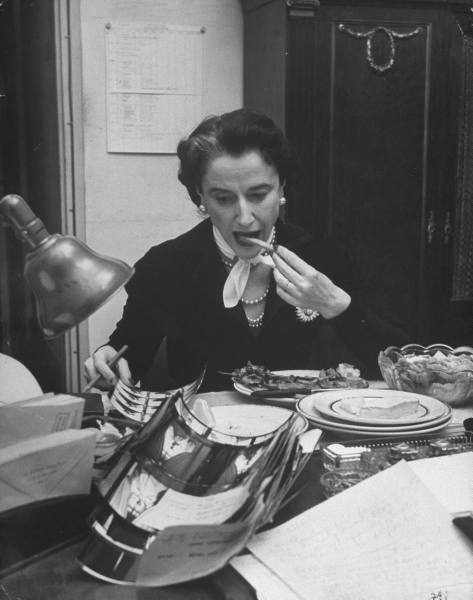 She will decide what to send to Vogue editor Jessica Daves in New York and then will finally go to bed. 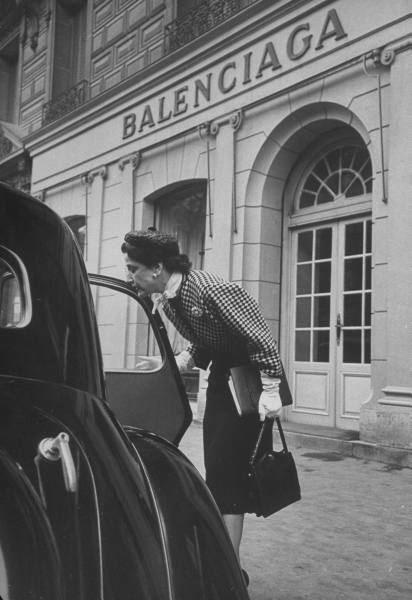 In 1960, Bettina Ballard published a memoire In My Fashion whichfurther chronicles her life in fashion. It's one of the only vintage books I don't own but I can't wait to read it! Bon Weekend!